Marine Geochemistry offers a fully comprehensive and integrated treatment of the chemistry of the oceans, their sediments and biota. The first edition of the book received strong critical acclaim and was described as ‘a standard text for years to come.’ This third edition of Marine Geochemistry has been written at a time when the role of the oceans in the Earth System is becoming increasingly apparent. Following the successful format adopted previously, this new edition treats the oceans as a unified entity, and addresses the question ‘how do the oceans work as a chemical system?’ To address this question, the text has been updated to cover recent advances in our understanding of topics such as the carbon chemistry of the oceans, nutrient cycling and its effect on marine chemistry, the acidification of sea water, and the role of the oceans in climate change. In addition, the importance of shelf seas in oceanic cycles has been re-evaluated in the light of new research. Marine Geochemistry offers both undergraduate and graduate students and research workers an integrated approach to one of the most important reservoirs in the Earth System. 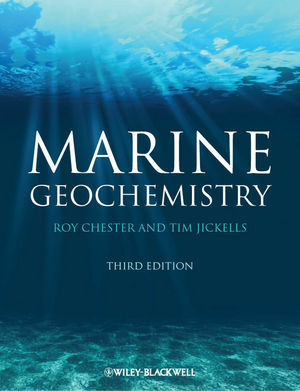 Additional resources for this book can be found at: www.wiley.com/go/chester/marinegeochemistry. Roy Chester recently retired from his post as the Proudman Professor of Oceanography in what was then the Department of Earth Sciences at the University of Liverpool. During his career he wrote over 140 scientific publications, and in 1999 was awarded the Hans Pettersson Bronze Medal by the Royal Swedish Academy of Sciences. He is also the author of ‘Furnace of Creation, Cradle of Destruction - A journey to the birthplace of Earthquakes, Volcanoes and Tsunamis‘. Tim Jickells is a marine biogeochemist with over 150 publications. He has been based at the University of East Anglia for more than 25 years and before that worked in Bermuda and Scotland. His main research interests are in atmospheric inputs to the oceans and coastal nutrient cycling and his field work has included tropical, temperate and polar environments. He was awarded the Challenger medal in 2006.